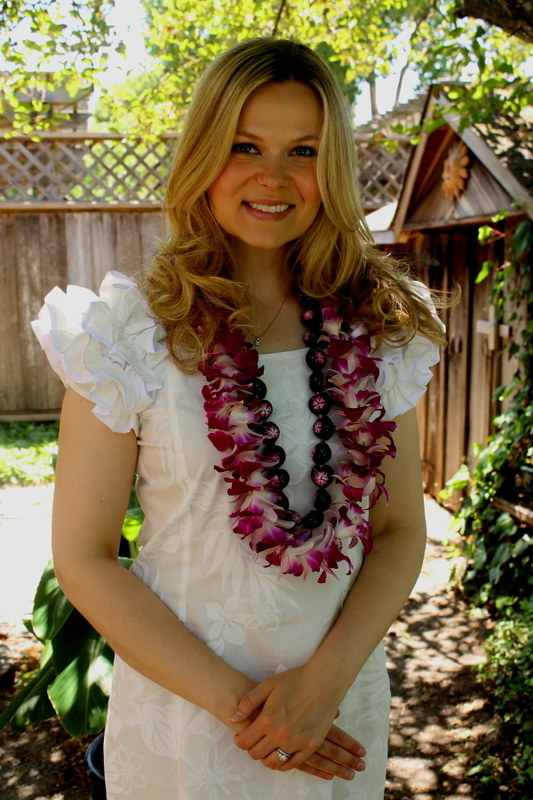 As you may have read in my previous blog, my daughter Kara was married in April. 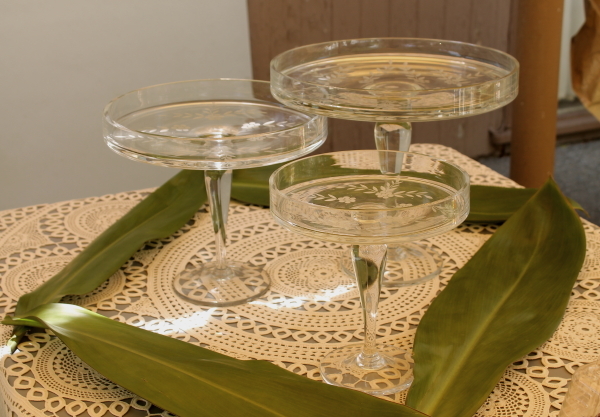 The wedding took place in New Orleans, a city much-loved by Kara and her husband, Robert. The wedding was very small, just family, but the celebration parties to follow are now, or are soon to be, legendary, to the families and friends. Since many people are unable to attend destination weddings, Kara and Robert still wanted to celebrate with their loved ones. Three party places were selected in various parts of the country so everyone could attend. First up a month after the wedding was in California, home of my mom and other relatives who could not attend the ceremony in New Orleans. The party took place in my brother Paul’s home, along with his wife, Inga, and their three daughters, Sia, Pesi, and Kato. Inga and the girls were born in the South Pacific island of Tonga, or rather, The Kingdom of Tonga. 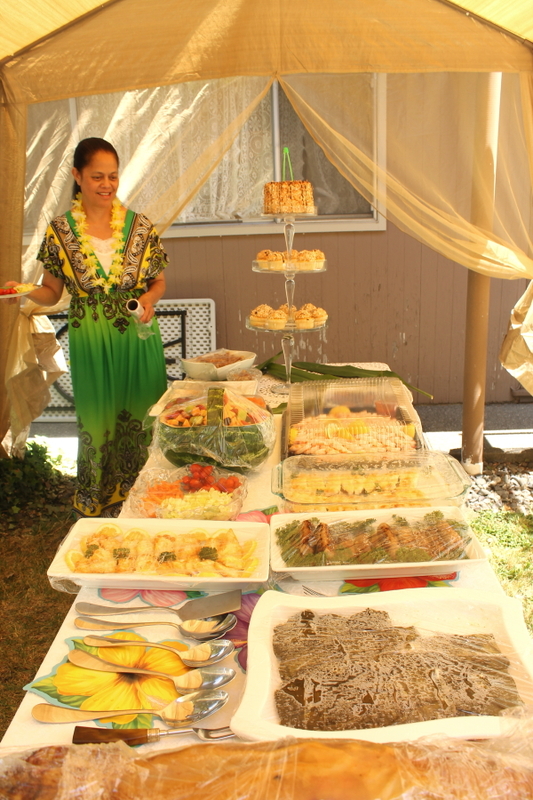 It only made sense to have a Tongan celebration party in their home. 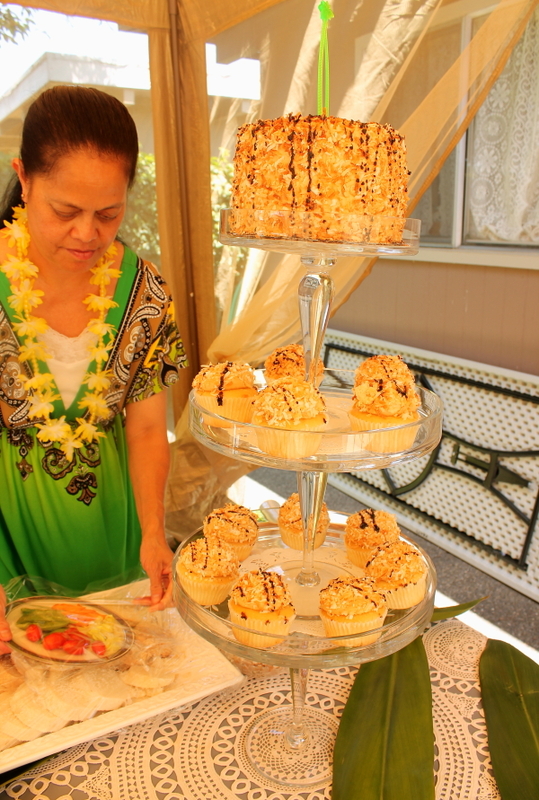 And oh, my, do Tongans know how to throw a party! Inga, the girls, and Inga’s sweet cousin, Malia, were prepared for a feast of the senses. When the guests first arrived at the front door, they were greeted by Pesi and Kato, who presented each guest with a lei, even to match their clothes! 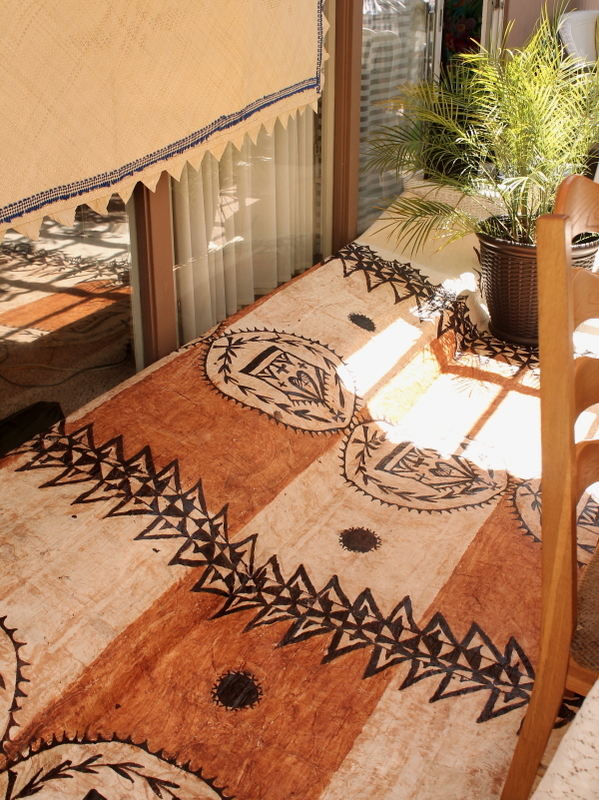 Pesi then proceeded to the backyard, which was turned into a Tongan paradise. 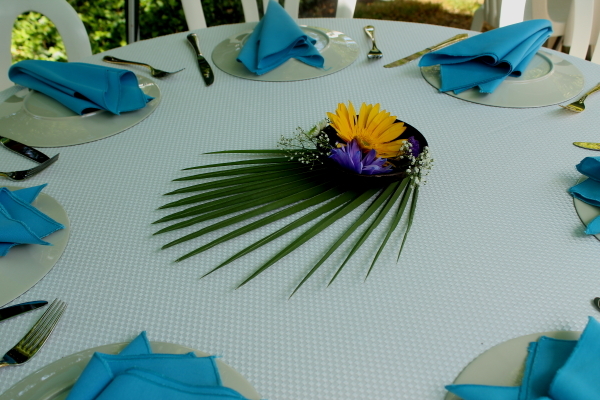 She started by setting the tables. 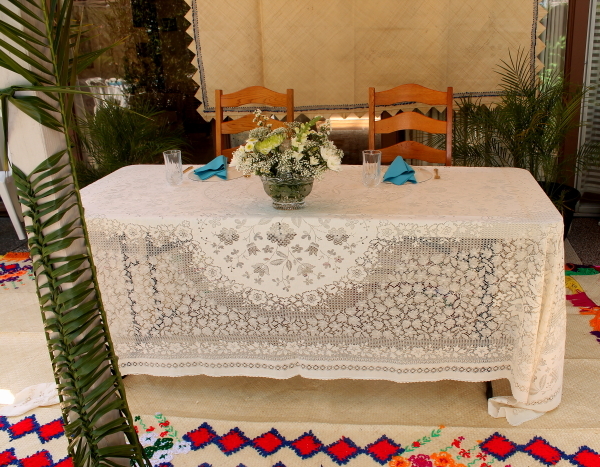 A special table is set up for the bride and groom, facing all the guests. 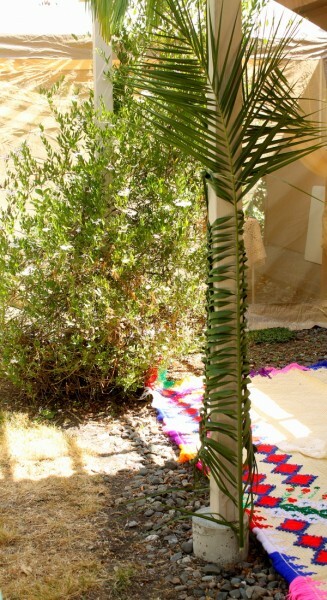 The posts are covered with palm leaves. 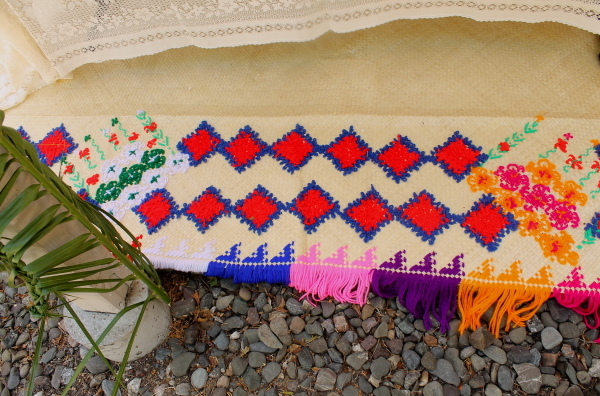 Beautiful hand-woven mats called “Ngatu” surround the bride and groom. The buffet tables are ready and waiting for the food. 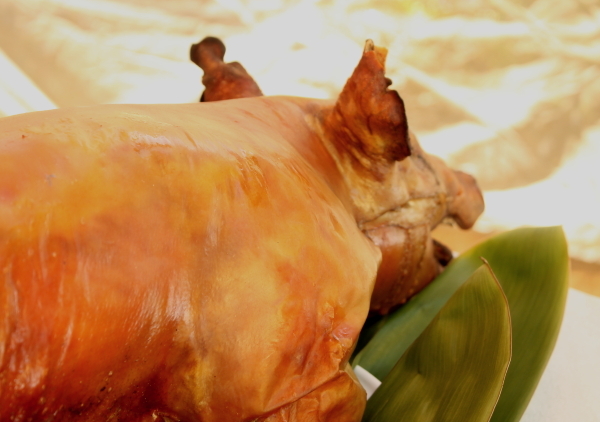 The first item of food to arrive is the whole roast pig, a tradition in Tongan celebrations. Inga and Malia bring out the rest of the food. 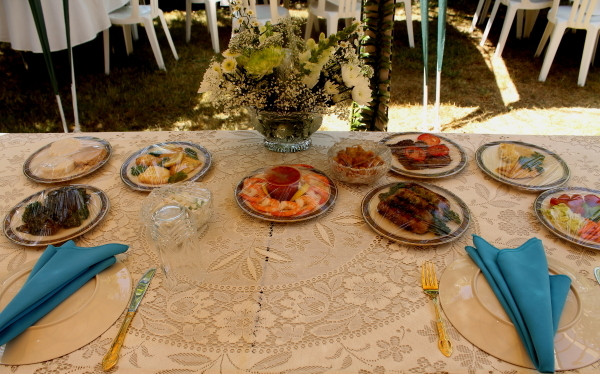 The food is set up at the wedding table. Now that everything is set up, it’s time for the beautiful bride to make her entrance! 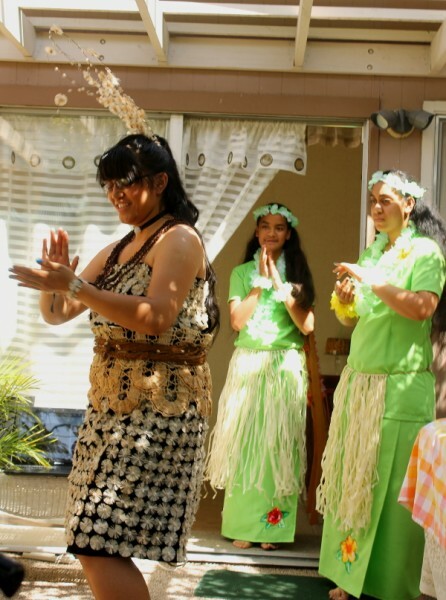 Kara is followed by the mysterious person with a Tongan fan..
It’s the maid of honor and sister, Kristina! Then of course it’s selfie time to mark the event! Now let’s get this party started! The guests are all seated, and the big surprise to come first is the presentation of the bride and groom in full Tongan wedding clothing. 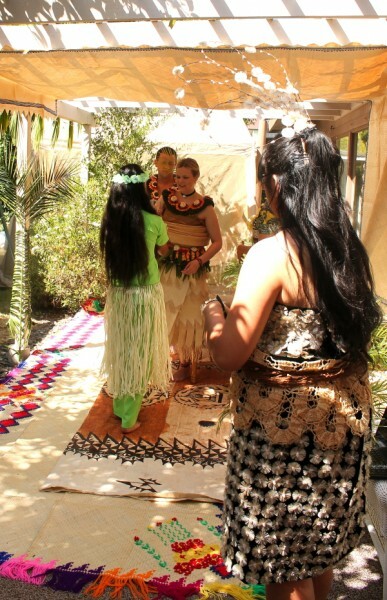 They repeat their vows (in Tongan; Inga laughed a lot!) followed by special dances from Sia, Pesi, and Kato. But that’s not all. Next up to dance is the bride and groom. They needed a little coaxing! Now it’s time for everyone to enjoy the delicious Tongan food prepared by Inga and Malia, which included halibut, chicken wrapped in taro leaves, beef strips, yams, shrimp, assorted vegetables, and my favorite, the ” ‘ota ika,” which is raw tuna mixed with among other things, coconut milk. It’s Inga’s specialty and to die for! The dessert was a coconut cake, but not your ordinary coconut cake. 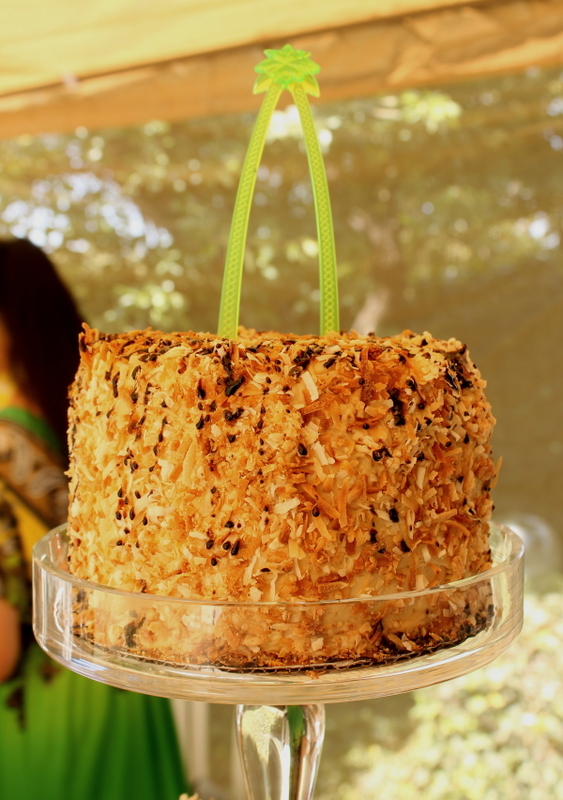 I wish I had the recipe to share; it was fabulous to say the least. 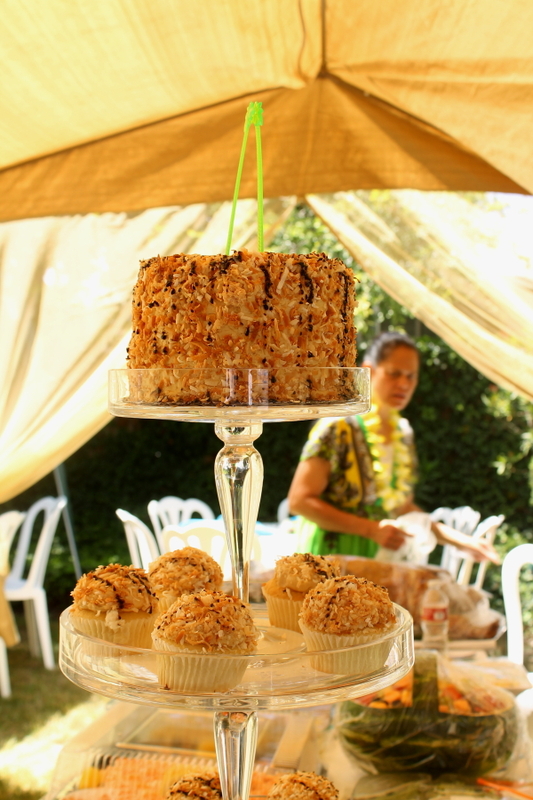 There were also some coconut cupcakes. After dessert, everyone sat around and chatted, having a great time, while going back and forth to pick at the last of that cake! The first party was a huge success. 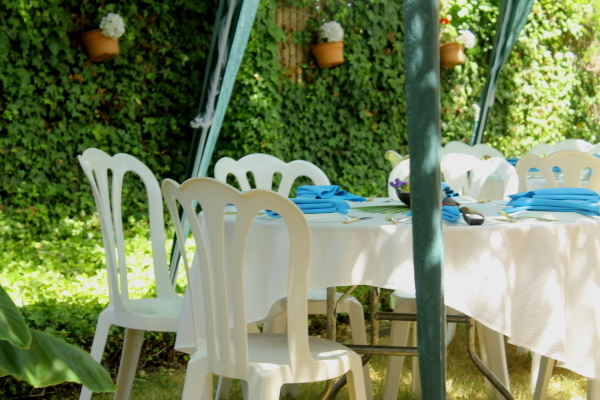 Next up will be a celebration party back at our home with a Finnish theme because twelve of our Finnish relatives are flying over from Finland just for the party! After that will be the last one at Robert’s parent’s home in Mississippi with Robert’s family, college friends, and old army buddies. I have never been to Mississippi before and can’t wait to enjoy some of the famous Southern foods. Watch for both those blogs soon! Now I would like to say “Tala mooni ki he ongo mea mali.” Best wishes to the newlyweds. We all love you both so very much. 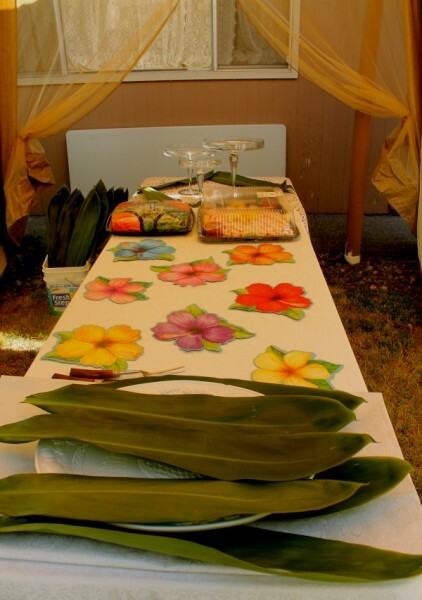 7 Responses to A Wedding Celebration – Tongan Style! Such a lovely post. 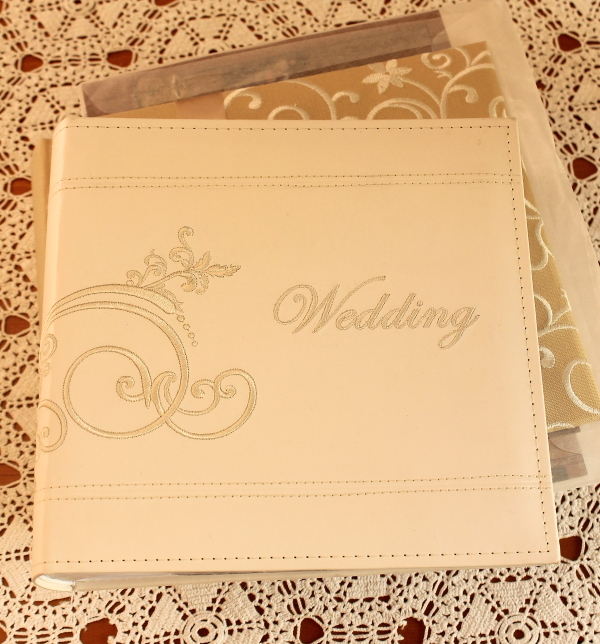 What wonderful memories the bride and groom will have of this fabulous celebration. What a fairy tale celebration! Something every girl has dreamed of. And what a labor of love preparing such a wonderful event for Kara and Robert. They are a very special couple who are blessed with very special families. Can’t wait to see and hear about your Finnish Makkara and Robert’s family celebration in Mississippi. Thanks so much for sharing. How wonderful and what an amazing celebration. We were so thrilled to be invited to your party and join in this memorable celebration. 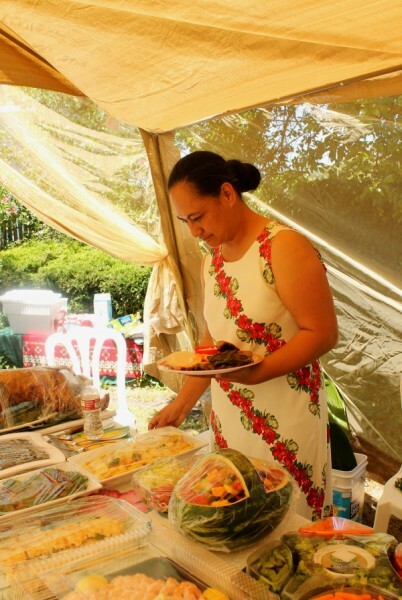 Who knew Tongans have so much fun! Kara and Robert and your entire family are such lovely people. Best wishes to the newlyweds for a lifetime of happiness together. How beautiful and unique … spectacular!